Many of the features and fixtures in these entry spaces are original. 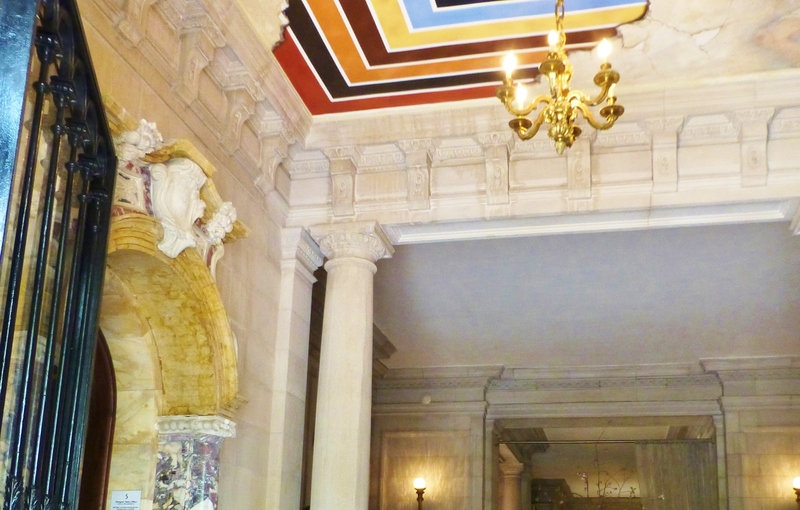 Obviously, things like the stunning carved stone-work and grand embellished mantelpieces were already in place. Last time, I shared about my recent visit to Mansion in May: the amazing designer house in Peapack-Gladstone, New Jersey. Today, I thought we’d venture inside the house. I’m so grateful the Mansion in May committee allows photography of the interiors, since many designer houses do not. I took full advantage of the opportunity to snap lots of images and am happy to be sharing them with you over the next several weeks! Let’s venture inside: upon entering through the fantastic front door, visitors are rewarded with an impressive stone-clad entry vestibule. This space was designed by Andrew Tedesco Studios, Inc., and the ceiling is handpainted to look as if the plaster is crumbling away. Inspired when chunks of paint were peeling away on the ceiling, the artist chose to paint a colorful mural in a Renaissance fresco style. The color really draws the visitor’s eye upward to the ceiling. 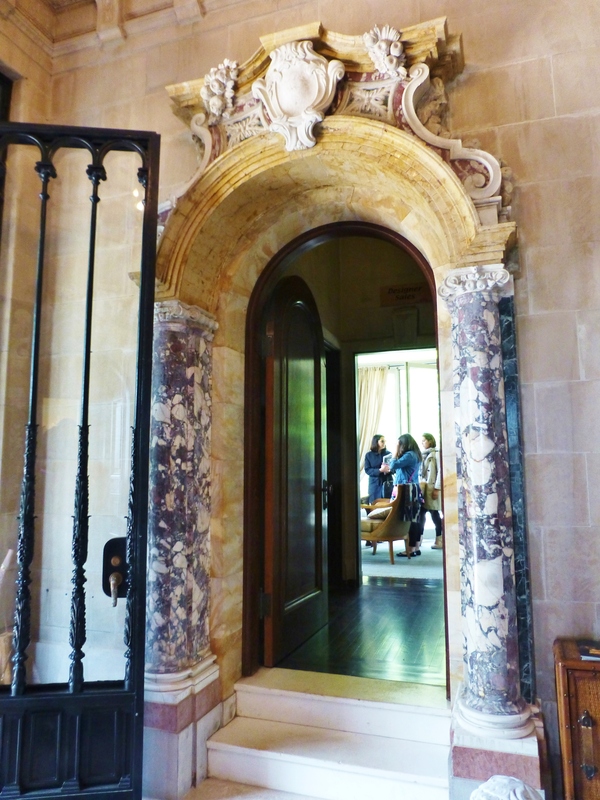 The entry boasts marble columns and carved stone-work. Very distinctive! The stunning stone entry hall by Megan Young Designs, boasts a gorgeous octagonal skirted table with Quadrille Fabrics and Samuel & Sons Trim. I personally love a custom skirted table, although they do come in and out of vogue. This one is tailored with an inverted pleat and uses elegant plum and ivory-colored fabric with 3 layers of an applied tape at the hem. The scale of the octagonal table is just perfect–it needed to be quite large to make a splash in the grand space. I will also comment that a dark wood piece would have been lost in the gray stone-covered space. The fresh light-colored background in this particular fabric allows it to pop and freshens the look. The softness of the textile is an added bonus in this room of predominantly hard surfaces, with no windows on which to apply draperies for softening. Many of the features and fixtures in these entry spaces are original. Obviously, things like the stunning carved stone-work and grand embellished mantelpieces were already in place. Much of the lighting is also original to the mansion. I was particularly entranced by these gorgeous antique sconces, shaped as a blackamoor hand extending a torch. These sconces are present in both the front and back entry. Aren’t they amazing? 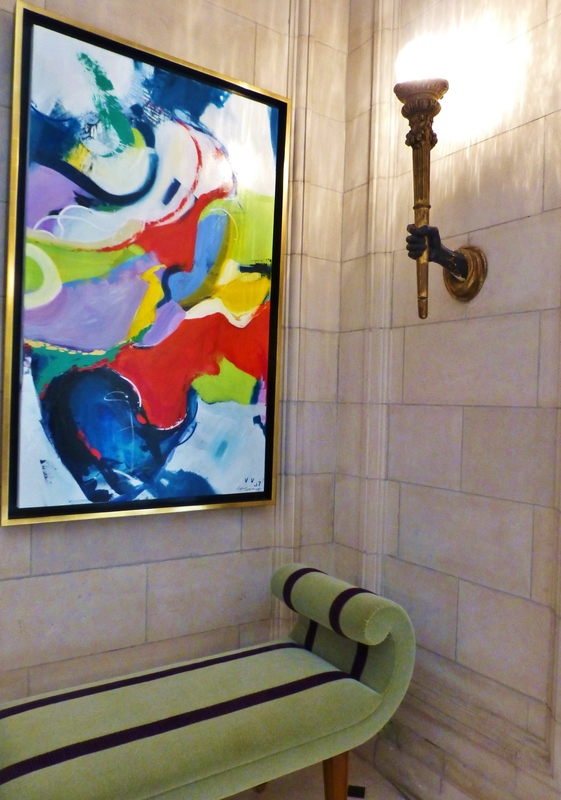 A colorful painting anchors this corner of Megan Young’s grand entry space. The velvet bench is so sculptural and elegant! Please feel free to leave comments and let me know what you think about these two beautiful designer house spaces. I LOVE to hear from you. Don’t forget to tell all your friends about Kristine Robinson’s Blog–I need all the friends I can get! This entry was posted in Architecture, Designer House, Historic Sites, Home Decor, Interior Design and tagged Architectural, Decorating, Design, Fabric, Furniture, Home, Interior, Interior Decorating, Interiors, lighting, Mansion, Mansion in May. Bookmark the permalink.